The Health & Wellness Guidance Crosswalk allows program and project managers to connect elements of the Guiding Principles for Sustainable Federal Buildings to industry standards such as LEED, Green Globes, WELL, and Fitwel, as well as federal standards for DOD and GSA. The expandable matrix view allows you to choose the criteria that best suits your project to promote health and wellness. The topics covered include Air Quality, Daylight and Circadian Rhythm, Diet, Exercise, General Health and Wellness, Potential Exposure and Risk to Occupants, Smoking Reduction/ Cessation and Views of Nature. The Crosswalk was created in collaboration with GSA’s Green Building Advisory Committee (GBAC). Building professionals and public health experts rarely speak each other’s language. SFTool helps bridge this gap by demystifying building sustainability strategies, technologies and construction practices for those not working in the real estate field, e.g. public health professionals. At the same time, the tool explains occupant engagement programs, work/life balance strategies and health promotion campaigns for those not working directly with human resources, e.g. Facility Managers. Understanding each other’s perspective is key to an integrative approach to building design and operation. A building affects health in many ways, as shown above in SFTool. 90% of the day. That’s how much of our lives we spend indoors. $225 Billion. That’s the annual cost of workplace-related illness. 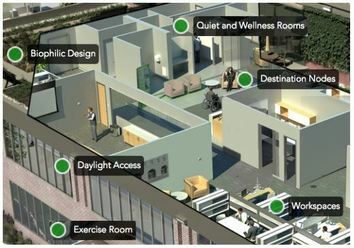 Imagine the impacts if buildings could enhance human health: Less absenteeism, lower health care costs, better individual cognitive function and improved organizational performance. These opportunities inspired GSA’s Office of Federal High-Performance Buildings (OFHPB) to establish a Buildings and Health Program to develop, validate and deliver building design and operational practices to enhance occupant health. Using graphics and plain language, the module introduces the complex concepts of health and well-being in a way that designers and project managers can easily understand and apply. New pages present original OFHPB research findings on circadian light, ventilation and biophilia as well as a Health and Wellness Guidance crosswalk that connects the dots between the Guiding Principles for Sustainable Federal Buildings and other industry standards, guidelines and rating systems. Michael Bloom, manages the Buildings and Health Program and SFTool.gov for GSA’s Office of Federal High-Performance Buildings.